Before allowing him to finish, I decided that was the craziest thing I’d ever heard. My feathers started to ruffle. This is church…a place where we should not have to discuss what makes us uncomfortable. I asked him to continue so that I knew exactly who I’d be giving a piece of my mind to. Somewhere along the way, and at someone’s house who will go unnamed to protect their innocently guilty self, he was on YouTube and found the movie trailer of that sick-o doll that comes to life and kills people. I can’t say or even type the name because it has been struck from our family’s vocabulary. Just know that since stumbling on that horror, he has obsessed over it. If we pass the movie section at Target and he sees it on the shelf, he goes around it, hands covering his face. We banished everything with eyes from his room: teddy bears, nutcrackers, even a mirror. For months we dealt patiently with him at bedtime. No matter the prayers offered, he was not convinced that God cared because his pleas for this evil to leave his mind would not go away. Regi and I took turns laying down with him and singing happy songs as he drifted to sleep. We left lights on. He would sneak into his sister’s room and sleep with her. He would moan down from the upstairs railing saying that within fifteen seconds of closing his eyes he would have a terrible dream. Nighttime was a nightmare for us all. 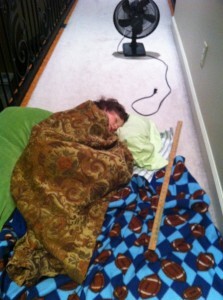 It even culminated with him dragging his comforter and pillows into the hallway and sleeping for a couple of weeks. Night after night he lay between the wall and stair railing, bundled like a babushka in his blanket to protect him from the bad lurking around him. About a week after he was forced to draw his deepest fear, I took some clothes to his room. His comforter lay in a crumpled mess on the floor. It struck me as odd because it was never that far from him at night. Later he said, “Guess what, Mom? I didn’t sleep with my comforter around me last night. I don’t have to anymore. And You Know Who doesn’t bother me anymore!” Remember that swell of relief I mentioned? Now it came across my face. That dreaded day in Kids Chapel something more happened. And after I untangled my tail feathers, Eli told me the rest of the story. “What happened after you drew this terrible picture of …” I asked. I’ll be honest. After he told me what happened, I shrugged it off as a cute-little-act done in cute-little-children’s-church. I mean, if my prayers hadn’t worked by now, he could never grasp the significance of shredding his fears into tiny little pieces. Don’t most parents drop their kids off in class with the simple hope that they’ll make a friend and put their quarter in the offering so they can call it a day? You mean my big God shows up in little kids’ church? While I’d like to say that Eli’s fears flew the coop the same night he drew that picture, it took a little time. It had to so that my grubby little fingerprints were nowhere to be seen on his miracle. When we try to make everything so perfect and unnerving for our kids, we interfere with God’s desire to show them who He is. Our vain attempts to smooth the rough waters called life means they don’t get to experience Him as Protector, Healer, Provider and Savior for themselves! Eli needed to see the life altering effect that happened when he faced that creepy little doll through the mighty power of a mighty God by tearing his fear to pieces himself. I’d rather my kids face life with a few battle scars because they’ve learned how to fight than show up to battle without a single skill. In conclusion…well, I really don’t how to conclude. This was intended to be a post on why I’m thankful for the Pastor Bill’s and Pastor Ian’s, the Brittany’s and the Amy’s, and all the others that call my kids by their name. Who pray for them. Who make them feel welcome every time they arrive. Who make church fun. And relevant. Who care enough to provide their lives as an example week after week. Who put up with chatty teenage girls who’d rather talk than pray. And who understand enough to show these kids that the same God who cares about mortgages and heart conditions is the same God who cares about boogeymen and midterms. But truly this post is about what I’ve learned from my own children…again. So if you’ll excuse me, I’ve got some pictures of my own to draw. And a lot of tearing up to do. Kim: I love this! Thanks for posting!! You’re welcome. Thank YOU for reading it! Bravo! Your God led message is one many of we Mom’s & Dad’s needed to hear. The seed..(time invested in this well written post) has been planted..now it is up to those who LISTENED to nourish it..so it may grow into “Peace that passeth all understanding” (Philliapians 4:7) Blessings! Thanks, Diana. I tried to cross my t’s and dot my i’s…and you noticed. Thanks a million times over for that! Phil 4:7…I speak that quite often around here! Great story & very powerful! Please keep writing. Thanks, Elina! The encouragement means more than you can imagine. I hope you found something in this post to laugh about because I can hear your laugh in my mind…it’s one of my favorites and I do miss hearing it more! Great post Kim. Keep up the good work! Wow, Kim. What a wonderful message by an outstanding writer. I am sharing with my daughter right now. And will keep tuning in! Well, I hope your daughter can use the same principle if she is dealing with something! I am grateful you took the time to read and respond. It means so much! What a wonderful post, Kim. Heartwarming, sensitive and thought provoking – I love how you blended the mommy tiger ready to pounce on anyone she thought was not meaning well for her child with the humble God-filled mom who recognizes thatwhat she thinks is not always as He acts. You are such a wonderful writer. I am proud to call you friend. Wow, Kit. I’m humbled! I do feel like a mommy tiger often but I’ve had to learn the hard way to simply keep quiet and wait it out…it has saved me from looking like a complete idiot. I love you, my wonderful friend! What an awesome story of the amazing and relevant God we serve. Thanks for writing and encouraging our hearts. Wonderful post! God does forgive me!!! Thanks for sharing that story. I, myself, had a similar experience when my daughter was little. I sure didn’t handle it in a loving way as you did. You have touched my heart by reading your posts today. God Bless You and Your Family. Thanks, Connie. Well, I left out lots of the stuff I wouldn’t want anyone to know! But it truly was a miracle that my son got over his fear and now bedtime is no sweat. I don’t even think he realizes how God truly got him through this but I remind him often! Thanks for reading. LOVE this story. So precious are our children that teach us so many lessons. I had a similar experience with Elijah over a similar character. I’m so glad you’re writing again, I always love reading what you have to say – you’re a great writer. Thanks for sharing. Hugs back! My kids have become the teacher and somehow, I the student. Thankfully we’re never to old to learn!